You want to JOIN our team! We currently want to grow our team. Write us and let us know why you want to be part of our team and what can you contribute. We are presently looking for motivated individuals to work with us on a casual basis. (No experience necessary. 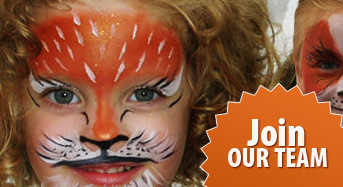 We can train you to become a face painter! This is a good opportunity for someone who wants to earn extra money, but still have flexibility in their own schedule. You work when you are available). We also welcome people who would like to volunteer!